My Colombian Recipes is celebrating its TENTH birthday this month, which is mind-blowing when I think about it. Instead of sharing a recipe, I wanted to do a giveaway as a way of saying THANK YOU to my readers, because without you, this blog would not exist! I can’t even tell you how grateful I feel every time I receive an e-mail, comment, or someone sends me a picture of a recipe that they’ve made. It’s such a wonderful feeling to be able to connect with others who love my recipes. The winner will be randomly selected and contacted via email, so be sure to enter your email address! Only one entry per email address. You must live in the continental United States. This giveaway will run from 12am February 9th, 2019 through 11:59pm February 18th, 2019. My favorite is the arugula orzo salad. It remains our “go to” salad to bring to share with others. Ajiaco Colombiano is my fav! I love Arepa de huevo!!!! It’s very difficult to prepare! Did it work out? I love Arepa de huevo! Answer: Are you kidding? There is no way to pick just one. They are all JUST THAT GOOD! Tacos de papas and the picadillo. Sorry I couldn’t choose just one! Love the site. Thank you for sharing all the wonderful Columbian recipes with us! Please: “colombian” our country’s name is Colombia! Thanks! Your tres leches cake has been a family favorite for years now! Arenas de choclo con quesito. Mil felicidades y que sigan los exitos. Congratulations on your blog’s anniversary! Thanks for bringing me back to my Colombian roots and for teaching us delicious recipes 🙂 My favorite recipe would have to be your pollo desmechado. It’s simple, easy, and sooo flavorful. I will eat arepa nearly any way, but this combo with pork and mushrooms is my favorite! My favorite recipe is Ajiaco!! It’s so hard to pick which one. I’ve gotten so many recipes from your blog and have learned so much about Colombian food. If I had to pick, the one my husband has enjoyed the most is the Salmon con salsa de camarones. My favorite is Stuffed Pork Loin. Pork is my favorite meat and I love trying new recipes and ways to cook and serve it. Je te suis toujours fidèle,mais cela fait plus de 4 mois que je suis silencieuse,car je me suis cassée les 2 épaules . Je quitterai la maison de convalescence à la fin du mois,mais j’ai encore de longs mois de rééducation. Hello hope your shoulders recover well! I love the “Pollo Guisado” recipe. I hadn’t had it in so long since I moved away from home. Instead of waiting for a visit from my mom, I decided to make it myself using this recipe. Delicious! It’s so hard to pick just one favorite! Seriously, all your recipes have been a hit! But this one is a go-to! My family requests this one often. Chicken in the pot! It’s my version of comfort food for sure. The fall of the bone chicken, the tender papas and the delicious guiso that is almost like a soup, then serve with rice! Delicioso!! I will note the recipe that brought me here. Ponqué (Colombian Pound Cake) was the link that started me reviewing your site daily. I’m not sure I have commented since I started “back then” but I check your site daily for interesting recipe. This one is still one of my favorite pound cake recipes. And I have made a LOT of pound cakes over the years. Congratulations on your anniversary. Here’s to 10 more!! I love seafood and coconut flavored dishes. My Mom is from Colombia, so I was incredibly happy to discover your blog. I love Colombia. Happy Anniversary!! I love the Creamy asparagus orzo!! All of them are my favorite! But I love ajiaco! I like the recipe for Torta de Quesito con Bocadillo. I love many recipes because they remind me of my upbringing in Brazil when my Colombian Mom cooked for us. I have been in the US for almost 20 years. When I miss my Mom who is in Brazil and has Alzheimer’s disease, I need some comfort Colombian food. Your recipes have helped me a lot like therapy. Yet, one recipe that was unforgettable and my husband’s family talks until this day was a Chimichurri Turkey that I made for Thanksgiving. We had extra chimichurri butter that people add to their bread rolls and it was a success. Arepas de Queso! It was the first time I’d ever discovered your site, looking for an authentic arepas recipe which I was making for the first time. They turned out splendid and so so tasty! Love your sabor!!! I love the Colombian-Style Red Beans! You have tons of delish recipes, but I love beans, and this reminds me of my dad’s favorite! Frijoles Rojos Colombianos are my family’s absolute favorite! I love most of your recipes; they’re all delicious. But my absolute favorite is your pandebono recipe. I make it often. Thank you for sharing all your recipes with us. You’re such a blessing! Hola, my all time favorite recipe is Carne Sudada. It is a big hit with family and friends. I love your site. Happy Anniversary!! Colombian Meatloaf! I’m fist generation American, both parents Colombian. This dish is probably in the my to three, all my American friends love it! Ahhhhh – definitely the “Buñuelos Colombianos”! My Abuelita Im Bogotá made the best buñuelos *ever*,… & your recipe motivated me to play around with several types of cheese to replicate the delicious flavor I remember. I use Valbresa French Feta made from sheep’s milk & a bit of queso fresca & I’m very happy with my version. Hello, my name is David Marcussen. My favorite recipe is Albóndigas con sopa arroz! When I have made these meatballs, my friends from Colombia agree they are as delicious as they are reminders of home! Thank you for a wonderful blog! A tie between arroz con pollo and ajiaco! My husband is Colombian so it has been so great to have your website as a resource to learn so many recipes and create dishes that remind him of home! This past Christmas we went to Bogota and we cooked for his family. Hope you’re still thinking of making a cookbook! I love all your recipe but my favorite is areas con huevos! I hope you can make your own cookbook soon! My favorite recipe from this blog would have to be chuletas de cerdo ala criolla! Served with rice and half an avocado, its the perfect week day meal. Its something i make on a regular basis. Thank you so much for all the unique recipes you post on this blog, its one of my favorites! The Colombian Breaded Pork Cutlets. Any pork recipe. A mi me gusta sus frijoles colombianos. Son muy ricos. Casi cuando festive trabajando en Colombia (1977!). I love the Frijoles Rojos Colombianos! Gracias a ti he podido encontrar los ingredientes y truquitos apra cocinar como en casa! Although, I love many of the recipes that constantly remind me of my Mother’s cooking. I now use the recipes to cook for my family. Congratulations on 10 years. That’s an amazing feat in a world with so many blogs out there!! My favorite is your Ajiaco recipe. Felicitaciones Erica por ese aniversario. Vivo en Miami hace 3 años y sigo tu blog. La receta que prefiero sin duda es la de los frijoles, porque los he preparado y me quedan con ese rico sabor que recuerdo de Medellín, ciudad a la que viaje muchas veces para hacer estudios de mercado y siempr me detuve en Asados Doña Rosa a comer eses frijoles deliciosos con sabor tipico. Arepa de Huevo because it reminds me of trips to Colombia and the vendors selling them on the buses in Luruaco, Colombia. Dulce de Leche and Coconut Roll (Pionono de Arequipe Y Coco)! Aunque suene exagerado, yo soy antes y después de My Colombian Recipes. Las recetas son muy fáciles de seguir y salen perfectas. Mi preferida los sudados de pollo o carne porque son platos que me encantan y nunca me quedaban bien hasta que seguí la receta acá y son una absoluta delicia. Gracias!!! I’m a fan of all Colombian Cuisine dishes. Reminds me my grandfather who came to Panama during the war. . Dishes my grandmother used to prepare to please him and of course, please all of her family. Pandebono is my favorite eventhough I’m a failure in baking goods. Pero soy tenaz. Kitchen and cooking is my thing. Almojábanas, no las arepas…no no no, avena… sancocho, Too hard to pick just one!!! Me gustan tantas de la recetas. Chicken with Lime and Honey. We have it 2-3 times a month. Hi Erica, todas tus recetas son deliciosas! Una de mis favoritas es el arroz con pollo! Felicidades en tu aniversario! Seguiremos comiendo rico contigo por muchos años más. Soy Colombiana y cuando me vine a USA no sabía ni hacer un arroz! He aprendido montones de tu sitio web, me encantan las recetas y las historias detras de ellas. Muchisimas gracias por traer a mi casa el sabor de mi tierra. MI esposo que es americano adora el arroz con pollo. A mi me encanta el pollo en leche de coco. Congrats on your blogiversary! My favorite recipe is for arepas rellenos — so delicious. Thanks for the giveaway opportunity! Para mi esposa y para mi, nuestros favorito es el Ajiaco y el Bistec a la Criolla. My wife is from Bogota and your Ajiaco recipe is the only one that truly reminds us of when we visit Colombia! Thank you and congratulations on ten years! One of my favorites has been the baked pasta with roasted vegetables. It is a quick an easy dish after a busy day. Congrats on 10 years. Looking forward to many more years and recipes. Hi there! Congratulations on your 10th year! My favorite dish is the traditional beans!! The arepas are also a hit at my house! Congrats on the monumental event! I love all of your recipes and have tried almost ALL! Me encanta la receta del Arroz con pollo! Congratulations and thank you for helping me become a better cook everyday! i really don’t want to have to pick only one! ALL of them are fantastic. i grew up in Colombia so being able to make recipes from my childhood here in the US is awesome. since it is winter at the moment i would have to say the ajiaco! thank you so much for this Blog! I always look at your recipes and have tried many of them but the ones I really appreciate are the ones for Columbian cheese rolls. I had some several years ago somewhere and being a home bread maker and wanting to make them myself I turned to your recipes. Costco now has them in the freezer and I’m glad other people are getting to taste them but I still like to use your recipes! I have followed your website for many years. In my case the favorite recipe has been el sudado de albondigas because it reminds me of my beautiful abuelita many years ago back in Bogota when she used to make me this sudado for my birthdays! The lentil soup is our favorite and a total comfort food. Especially good on a cold and wintry day. Hola, primero que nada, muchas felicidades 10 años deleitándonos con tus recetas que traen sabor, alegría y nostalgia a la vez! Me encantan todas y lo fácil que haces las instrucciones a seguir! Una de mis favoritas es la de los tamales -una delicia! 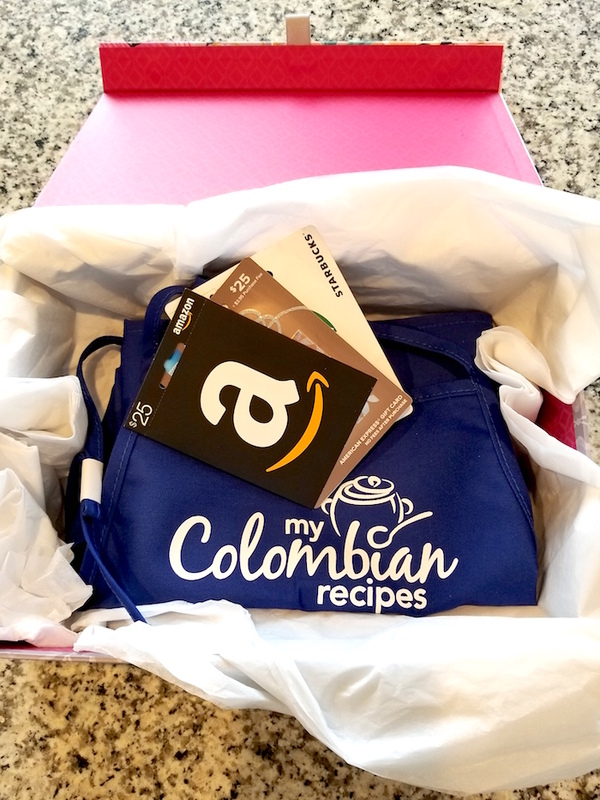 Gracias por promover la cocina colombiana es de gran ayuda consultar las recetas y prepararlas cuando estamos tan lejos de la patria! Cali, and I miss my food so much! If I have to pick one, definitely pandebono y pan de yuca! Discovering that I can actually make them at home and have my kids try a little bit of my country is the best feeling ever!! Me encantan almojabanas. Soy de Colombia pero vivo en Wisconsin. Love your recipes, the one I’ve probably made the most and a favorite is frijoles colombianos. But also love the arroz con leche. Yummy. I fell in love with Arepas when visiting my daughter in Medellin. I think that’s about when I found you and your lovely blog. So I’d have to say Arepas de queso would be my fav recipe! Empanadas! My favorite food in the world and I never could make them until I found your recipe. Thank you!! Pandebono! People ask me to bring them to potlucks now. So easy and so tasty. Felicidades! Aquí aprendí a cocinar nuestras delicias. Mi favorito plato es Encocado de pescado. Una de todas las recetas favoritas, fue la de los buñuelos. A mi familia le encantó. Gracias por ayudar en mantener nuestra cultura por su gastronomía. Dios la guarda. Me encantan todas tus recetas, pero las empanadas son las favoritas de toda la familia. Mis se ahora siguen la receta y hacen solas! Gracias por tu gran trabajo es fácil facil medir ingredientes y dar recetas tan bueno hechas! Felicitaciones y por muchos años más! So it’s probably such a basic answer but the Colombian style roasted chicken drumsticks! I’ve never been able to get the right taste with drumsticks unless I like drowned them in bbq sauce. & drumsticks are so budget friendly, after trying your recipe they come out perfect!! I’ve used that marinade in other recipes too. I love it. Cazuela de Mariscos its my favorite. Thank you for your Colombian recipes. Our favorite is Black bean soup with plantains. I make it at least once a week for my husband and kids and they love it! Thank you so much Diana for your delicious recipes and Congrats on your 10 year anniversary! “Ajiaco” OMG it’s so delicious! Love to make Pandebono! IT isn’t rhe best and easy recipe. My family love it. Thanks! I love all the recipes. I have visited Colombia many times and love seeing some favorite recipes and some I haven’t seen yet. Omg! So hard to choose! Born here but parent Colombian, de Santander, Bucaramanga! I get excited when I see all these goodies. I’m still hoping you will come out with your recipe book someday! My favorite recipe is going to have to be el bistec al caballo and your ají recipe. Oh boy…hard to choose one. But, I think the empanadas go the most quickly around here. It’s great to be able to find Colombian recipes online. Thank you. I’m Colombian. Husband is Irish. Ajiaco Colombiano is delicious!! Your recipe is my favorite!! I follow the recipes for sancocho and empanadas! My Colombian husband always approves! Our favorite recipe is Ajiaco. Thank you very much for all of your work! Over the past few years I’ve tried severa of your recipes!! I would have to say my favorite one right now is the tree leches. It’s a staple now in every holiday/get together! Son tantas las receticas que me encantan, pero creo que sin duda los buñuelos! En invierno los amo y cuando llegan las festividades no falta! Gracias My Colombian recipes por tanto. Our favorite is black bean soup! I make it for my husband and kids at least once a week and they love it! Thank you so much Diana for sharing your delicious recipes with us and happy 10th anniversary to My Colombian recipes! Son tantas las recetas que me encantan, pero creo que sin duda los buñuelos es mi favorita! Gracias My Colombian recipe por tanto. Our favorite is black bean soup. I make it at least once a week for my husband and kids and they love it! Thank you for sharing your delicious recipes and bringing us a little closer to home. Congratulations on the 10th anniversary! The first recipe I tried from this site – Arroz con pollo – is still my favourite. Nice to bring some flavours of Colombia to Sweden. Congratulations on ten successful years with your blog! Can’t believe it has been 10 years?! I think I found you right when you started this blog. Also, can’t believe I have to choose just one favorite recepie…. definitely my favorite is Cocktail de Camaron. But Papas Choriadas, Hogao, Empanadas, Arroz con Pollo, and Esponjado de Maracuya all tie for 2nd place. Erica i’ve been following your recipes for a while and while there are many favorites, the Hot dogs just hit the spot and finding the sauces for fast food was the best!!! Your recipes are very authentic and taste like thome thank you! Is so difficult to choose only one but I remember the first day when I cooked milanesa of chicken with the perfect recipe ever. My husband was so happy and he still asking me when I’ll do it again. Thank you so much for bring many wonderful possibilities of food and creativity in the kitchen with this blog. Congratulations on 10 years! You were the first good Colombian blogger and I’ve been a follwing almost that long! Felicidades! My favorite recipe is Papas Chorreadas! It brings me right back to childhood. I love all your recipes though. After living in Santander, Colombia for a year back in 2009, I was homesick for Colombian food and found your blog! I’ve been following it since… my personal favorites of your recipes are the Arroz con Pollo, Changua and Crema de plátano verde!!! They bring me right back to my days in San Gil!! The bunuelos are my favorite. Bunuelos make everything better. The empanadas colombianas; a classic, of course! And the recipe that made me find this blog. But honestly every post makes me drool. Congratulations on ten years, and thank you so much for putting your recipes on here!!! Y qué tal esos frisoles paisa!? Eso es vida! Hi! Thank you for your website! It’s truly amazing. I met my colombian bf in Russia and he was missing his cuisine so much, thats when I discovered your website and could make a small miracle for him. Now we live inColombia and I am so delighted with the food here, but since long ago my favourite dish is your Torta Negra, it takes like a week to make but it totally worth it. El Sudado de Pollo. Delicious! He disfrutado mucho haciendo las recetas que de alguna manera o se habían olvidado o no podía encontrar un sustituto para preparar las, tratando de darle ese sabor latino muy nuestro. Es difícil mencionar sólo una receta, para mi el sancocho, ajiaco, arroz de leche flan….. son excelentes. Muchas gracias por estar aquí desde hace tantos años. Un gran abrazo. First I want to say thank you so much for this website. My mom came to the states when she was 14 years old. Even though she came to the states she always celebrated her Colombian heritage. My choice for favorite has to be Sudado de Pollo of course! It reminds me of my grandpa who used to make it every Sunday. Mis favoritas son las de las cosas horneadas y la de los buñuelos. We visited the Antioquia and coastal Caribbean regions and absolutely enjoyed the menu del dias found at all the local cafes. It was a delight to find your recipes and have enjoyed the frijoles rojos Colombianos, patacons, arroz antioqueno, and sancocho. Thank you for making these available! Aji Picante!!!! I put it on EVERYTHING! But let’s be serious, they’re all delicious! Hi Erica ! Congrats on the blog’s first decade. I’ve been using your recipes way before I moved from Colombia to the US. My favorites are : the aliño recipe for its versatility, and the baked empanadas, because they’re foolproof and perfect each time. Sudado de carne/ pollo! Algo que siempre les hago a mis abuelos y les encanta sentir ese sabor autentico Colombiano. Gracias por todas tus recetas! I love the “carne desmechada”. Your recipes are very good! thanks for sharing! Una amante de sopas! El sancocho de cola! Felicidades! The Salpicón de Frutas is my favorite. I’m still learning how to cook! Sopa de lentejas! I’m living on a tight budget as a university student so i make this all the time and love it 🙂 love your blog !!! I have not yet tried one of your recipes, but would very much like to try the Ajiaco Colombiano. Felicitaciones en sus 10 años!!! Es un blog SÚPER chevere! Es difícil escoger una, todas son excelentes! Me encantan las sopas y es con esto que me fascina el sancocho de cola! Delicioso! Hola Erica! Me encanta todas tus recetas, pero la favorita es el pan de quedo. My baby girl, mom, husband and even my mother in law liked when I learned to make them. It brings us a little closer to my mom’s culture and I love seeing them enjoy it with a hot chocolate. Thank you for all your recipes! Felicitaciones Érica por llevar tu página por ya 10 años! Vivo en Alemania y me encanta leer tus recetas y por supuesto preparar alguna de ellas! Son muy fáciles de realizar y representan muy bien nuestra cocina colombiana! Adelante y muchos éxitos más!